About 1856, Danes began to emigrate to Montcalm County, Michigan. The first ones settled northwest of Greenville with Sidney and Edmore becoming other popular destinations. Early church services for the new residents were held in the log school houses that had been built. After a service at the Monroe School north of Greenville on April 22, 1873 by Rev. T.H. Wald, a desire to organize a church became evident. 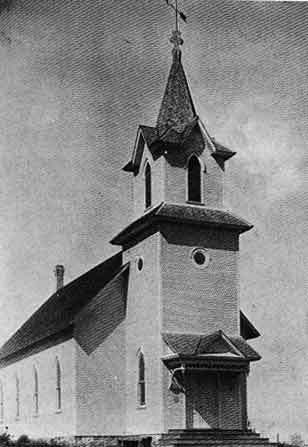 Finally, on April 21, 1884, work began on St. John’s, now called North Sidney. Christian Winter laid the foundation and plastered the walls. 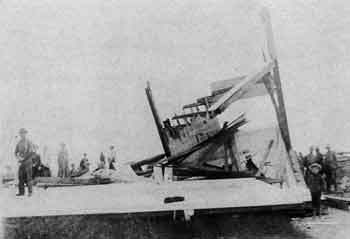 Niels Christiansen of Greenville, assisted occasionally by his son, did the carpentry. On November 16, 1884, Rev. Ole Amble dedicated the building. At the end of the service, after the church bell first rang out, William A. Nielsen, born November 12, 1884 in Stanton (son of Niels and Otine Nielsen), was baptized. New St. John’s in 1903. Still standing today. On Tuesday, June 12, 1902, a tornado swept through the area — moving fences, uprooting trees, and demolishing St. John’s. 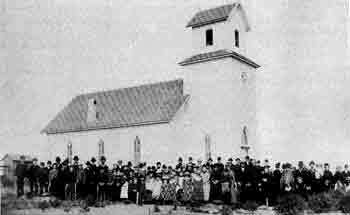 By July 12, 1903, the members rebuilt their church and it still stands today. Read more about the history of North Sidney and area residents in North Sidney Area: 1884-1984, a book self-published by the Association.